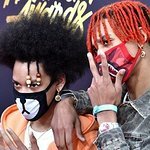 Ayo & Teo are a duo of dancers from Ann Arbor, Michigan. They have appeared in music videos for Usher’s “No Limit” and Chris Brown’s “Party”. Their song “Rolex” peaked at number 20 on the US Billboard Hot 100. Google trends for "Ayo & Teo"